A Dutch woman calling herself Emilie has rented a remote farm in Wales after admitting to an affair and leaving her husband. Escaping from something unknown to us and existing in self-inflicted solitude, Emilie seems to be waiting for something. But a boy out walking his dog interrupts her seclusion. Meanwhile back in Amsterdam, Emilie’s husband attempts to trace her. What initially struck me when I read the book’s blurb and began reading the novel was the similarities to Evie Wyld’s All the Birds, Singing: a woman escapes to a rural location wanting to be alone, animals mysteriously disappear (in Wyld’s novel it’s sheep; in Bakker’s it’s geese), and a stranger arrives. But it would be unfair to compare these two novels. In fact, as I read The Detour I soon forgot my initial impression as I became engrossed in Bakker’s prose and the mystery of the novel. The Detour is a slow-burning novel where nothing much seems to happen in terms of action. Yet it’s a book that explores many ideas and left me contemplating it long after turning the last page. Mystery lurked beneath Bakker’s stripped-back prose and pulled me into the story. Despite the prose’s sparseness, Bakker writes in detail on Emilie’s work around the house and garden as she conducts her solitary existence. But these tasks don’t feel as if she is planning for the future and forging a life for herself; instead there is the sense of her simply passing time in the Welsh cottage. Bakker’s detailed descriptions mean that we pass the time along with Emilie and are left with the sense of waiting, too. The arrival of Bradwen – often referred to as “the boy” – breaks Emilie’s solitude and the sense of waiting, adding an interesting dynamic to the novel. I enjoyed the characterisation of both Emilie and Bradwen, particularly the relationship between the two. Emilie is at the centre of the book’s mystery, yet she reveals very little to the reader. We rarely hear her speak and she doesn’t reveal her name until late on in the book, creating a distance between her and the reader. This could have made me feel as if I had no connection with her, but it works to create her enigmatic character throughout the novel. She is well written by Bakker with her perspective feeling true, unforced, and natural throughout. Like Emilie, Bradwen also had mystery surrounding him, but he came across as an assured and fleshed out character, despite us knowing hardly anything about him. Certain chapters return to Amsterdam and Emilie’s husband – referred to as “the husband”. Whilst I felt that he was one of the least fleshed out characters, his chapters work to pace the novel and bring a sense of impending doom throughout, as well as offering a glimpse of life outside Emilie’s self-imposed small world in Wales. 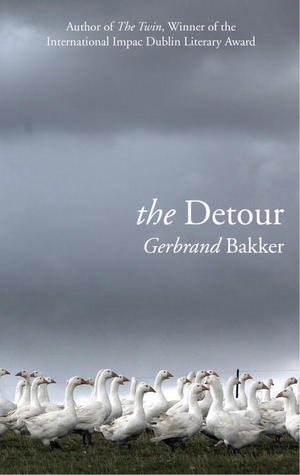 Gerbrand Bakker’s writing in The Detour is an example of the kind of writing I like: sparse but atmospheric, quiet and controlled but powerful – all of these work here to create an intriguing, moving, and atmospheric novel. Descriptions of the landscape are vivid and unsentimental, while descriptions of smells pervade the book, adding to the atmosphere. Winner of the Independent Foreign Fiction Prize, The Detour is a quiet, subtle, and understated novel which leaves plenty unsaid. Mystery and a sense of foreboding slowly develop throughout and have continued to linger long after I’ve finished reading. I think this is what makes the book so successful for me – long after finishing the book I can still remember feeling unsettled at times, the atmosphere, the landscape, and the intrigue of the novel. Based on The Detour, I’m eager to read Bakker’s first novel, The Twin, which won the International IMPAC Dublin Literary Award. Have you read either of Gerbrand Bakker’s novels? What did you think? Ohh, you had me at ‘self induced solitude’! Is that human instinct to want to observe how other people conduct their solitary hours? Or am I just nosy? Either way, this sounds quietly fascinating. I haven’t actually heard of this particular author however your has intrigued me and so I have made a note to check Gerbrand Bakker out. Observational, in the sense of coasting through day to day life, and atmospheric are some of my favourite novels but I don’t read them often enough. Thank you for exposing me to not only a new book, but a new to me author.